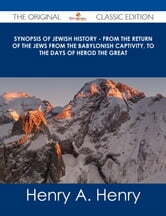 Synopsis of Jewish History - From the Return of the Jews from the Babylonish Captivity, to the Days of Herod the Great - The Original Classic Edition Rakuten Kobo. 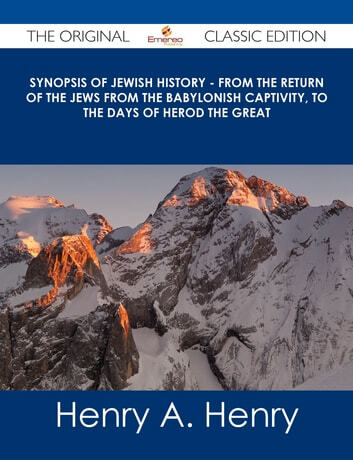 Finally available, a high quality book of the original classic edition of Synopsis of Jewish History - From the Return of the Jews from the Babylonish Captivity, to the Days of Herod the Great. It was previously published by other bona fide publishers, and is now, after many years, back in print. This is a new and freshly published edition of this culturally important work by Henry A. Henry, which is now, at last, again available to you. Get the PDF and EPUB NOW as well. Included in your purchase you have Synopsis of Jewish History - From the Return of the Jews from the Babylonish Captivity, to the Days of Herod the Great in EPUB AND PDF format to read on any tablet, eReader, desktop, laptop or smartphone simultaneous - Get it NOW. Zerubbabel, who built the Temple and the Altar; Ezra, who reformed and re-established the sacred religion to its former standard, which, during the captivity had undergone many changes and innovations; as the people were not in a position at that time fully to observe it, as it was practised in the palmy days of their Fathers; and Nehemiah, who built the walls of the City, and ably assisted Ezra in his good work in introducing and ultimately effecting a great and solid improvement among the people. ...One of the strongest proofs that the Jews are correct in this respect is, that recent travelers have stated in all their journals, that wherever they met with Jews and their Synagogues they found a uniformity in the Scroll of the Law as read in the Jewish Church; besides, if we take into our consideration that Moses either wrote himself, or had written, thirteen copies of the Pentateuch, one of which he gave to each of the twelve Tribes, and the other he deposited in the Ark to remain there, in obedience to God's command in Deuteronomy, 20Chap, xxxi: 26, it is not at all surprising that the Jews have the original law in their possession, as handed down from Moses, the Divine Legislator. ...The king, by another royal edict, published throughout all his dominions, that the Jews should be empowered on the day named by Haman for their destruction, to stand on their own defense; and as this decree became known all over the land to be the real wishes of the sovereign, and Haman being no more, it proved serviceable to the poor Jews, and fully answered all that could have been expected; but yet, not without great slaughter among the people during the various conflicts and battles which took place on the day appointed. The Nestorians; or, The Lost Tribes.